The Americans have found the healing of God in a variety of things, the most pleasant of which is probably automobile drives. Thursday, May 7, 2015: When we last visited our intrepid (or is the word inept?) travelers they were under the threat of rain and making emergency repairs to a tear in their camper’s roof. Well, it didn’t rain…..it hailed…..a lot! Well, sounds like a leisurely breakfast morning! Once the onslaught moderated, Kit and I ventured out from Yosemite Lakes Campground and hopped on CA-120 heading west. 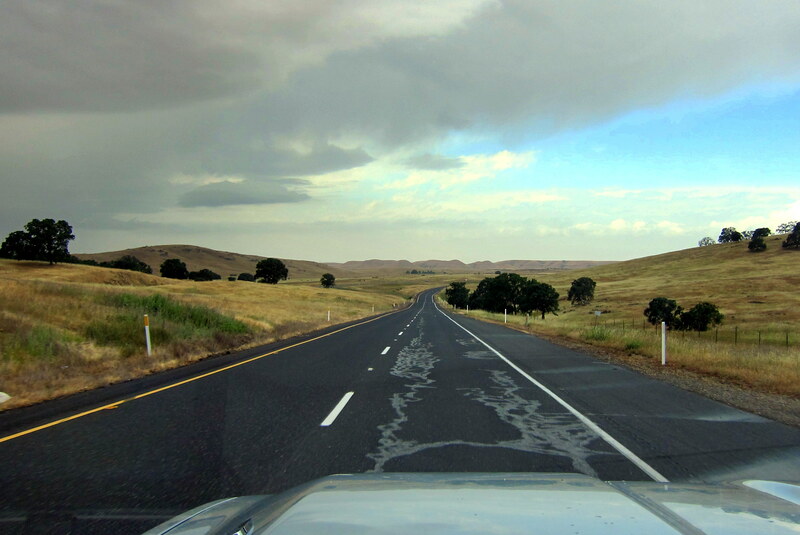 Soon, we were rolling through the small town of Groveland, California. 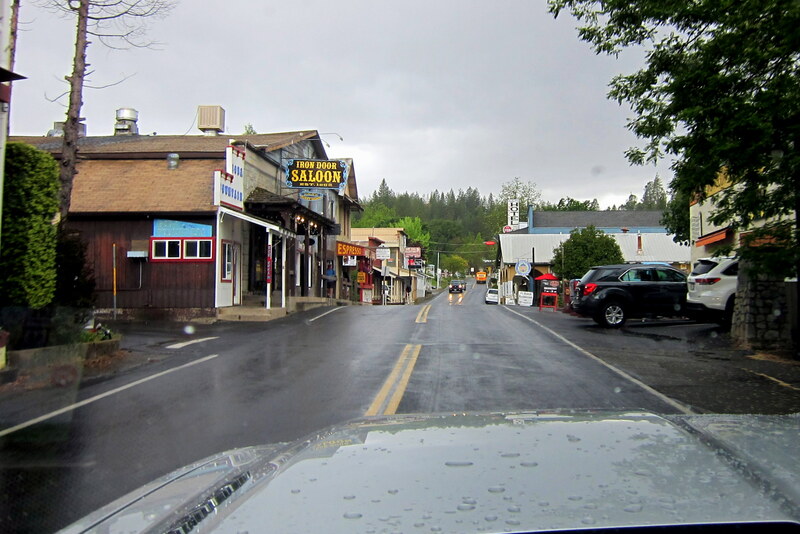 A mountainside no-stoplight little town with a quirky vibe….if it wasn’t raining so hard, and had we left the campground at an earlier hour, we would have stopped to walk around a bit. A short while later, the weather did let up so we pulled off at a turnout overlooking Don Pedro Reservoir to see how the roof patch job was holding up. The early morning hail, which had changed over to a steady rain, gave the Yankee repair job a real test. However, I’m happy to report no leaks in the roof…..score another point for Duct Tape! 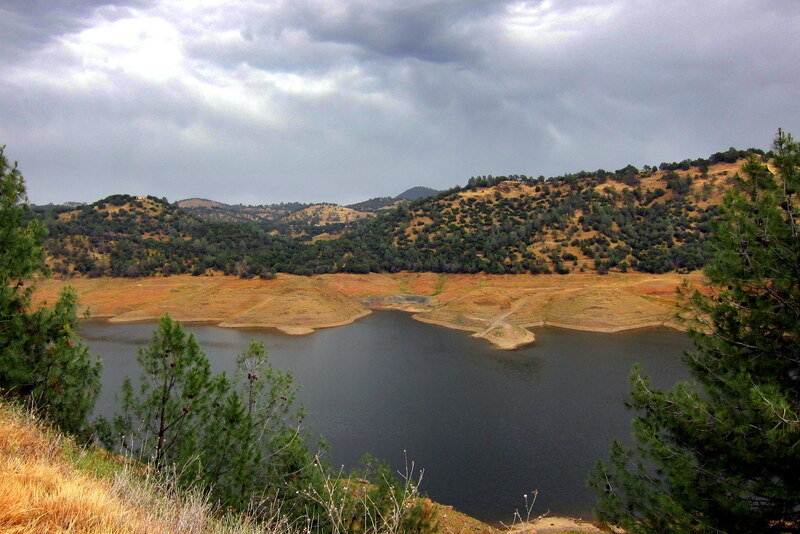 The precipitation is a welcome sight in California, as they are experiencing a record drought, as evident by how low the water level is in the photo above. Back on the road and a few hours later the skies began to clear as we moved over to CA-99 heading north. 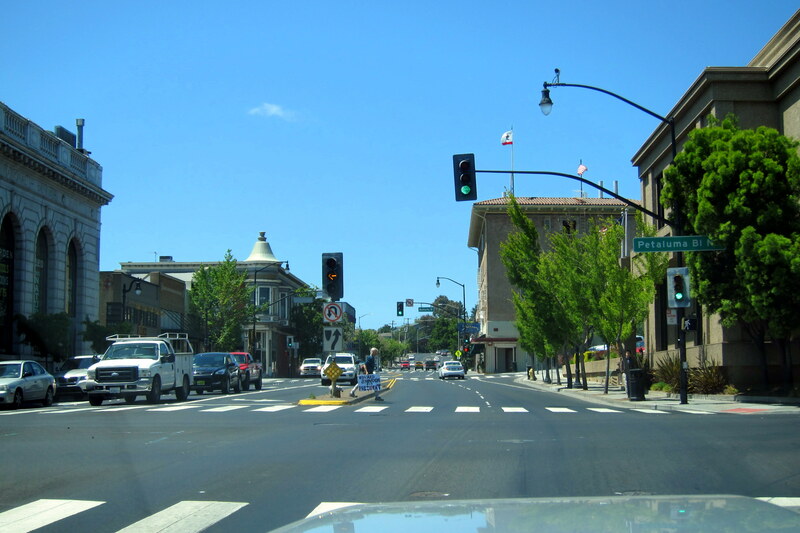 And, by 1300 we were driving through Fairfield, California on the way to our next stop…..Travis Air Force Base campground. Since there were a number of sites available, we choose a nice secluded spot with flowering bushes on either side which created our own little private garden patio! 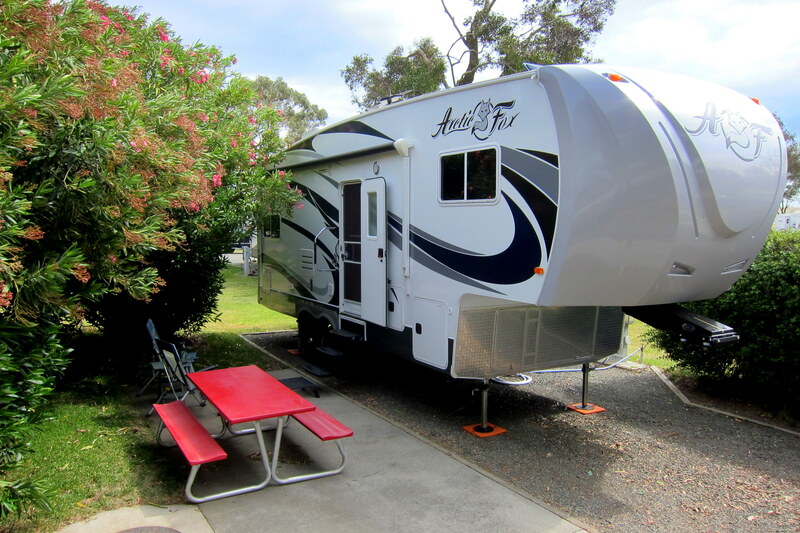 Friday, May 8 through Monday, May 11, 2015: Fairfield, California: Kit and I decided to stay three full days at this park for a variety of reasons. First, there are folks living in the area from our old San Diego neighborhood that we just reconnected with and are anxious to visit. Second, we needed a down day to recharge, resupply and goof off. And thirdly I had to find a way to make a more durable and permanent patch to the camper’s roof. Since this could impact the rest of our trip, I tackled the last item first. 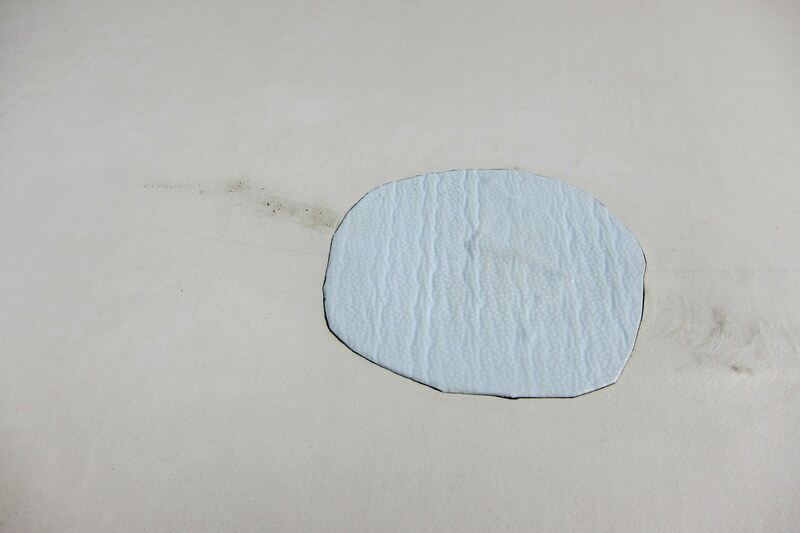 In researching how to patch EPDM roofs, I discovered that the process was easy, but the materials were specific (read difficult to locate) and a bit pricey. Fortunately, the folks in the campground office knew of a fella that ran a mobile RV repair business. Upon calling, Norm mentioned that he had retired at the first of the year so therefore hadn’t renewed his business license. However he still had some patch material and the proper tools so would be glad to drop by and take a look. After climbing on the roof, Norm said this is pretty typical, an easy fix, and he used to make a good living doing these types of repairs. He also said he would do the job for us if I would make a donation to the local volunteer Fire Department that he was a member of……sounded like a win-win to me so I took him up on his offer. Good as new! Hey, it is new……just now with a few battle scars! There were a few other areas that looked suspect and a few scrape marks that Norm reinforced with a layer of patch material…..a very thorough job! He also gave me some additional material and a quick lesson on how to apply it for the next time…..and, he said, there will be a next time! Living in the town of Dublin, about an hour south from Fairfield, is a friend of Kit’s from her Junior High school days. 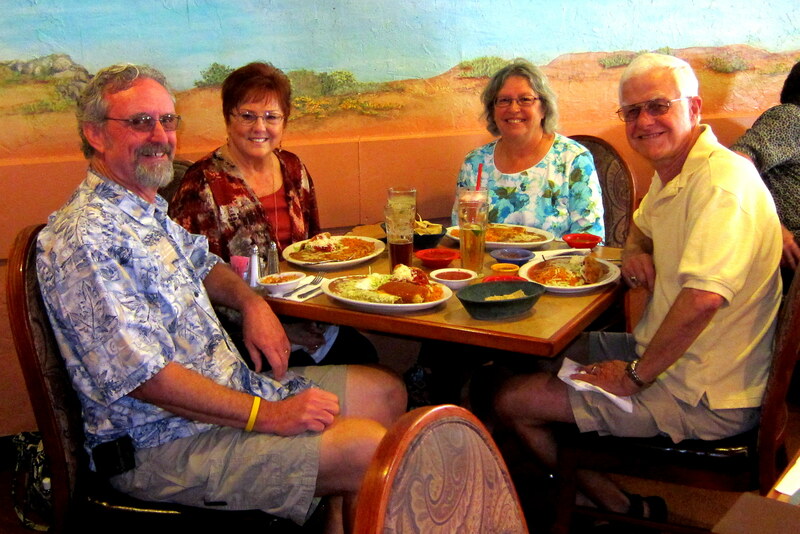 Nancy, and her husband Chuck, graciously agreed to meet midway at a nice Mexican restaurant called LaTapatia. Kit and Nancy had a great time reconnecting….they were classmates in the same San Diego junior high school and sharing the highlights of their lives over the last 50+ years was fun and enlightening for all. And Chuck, a former Vietnam helicopter pilot, and I had a great time getting acquainted and swapping military stories. Oh, and the food was great as well! We thoroughly enjoyed their company and hope to see them again on a future trip. 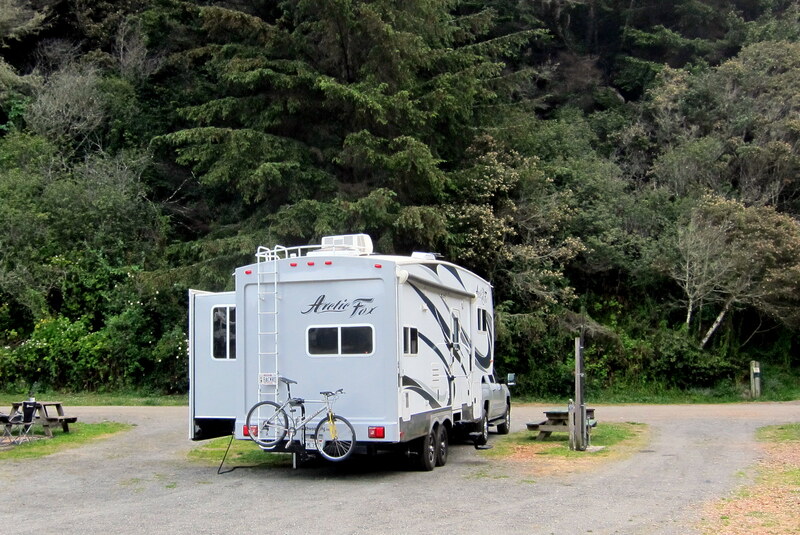 Camping on a military base has some additional advantages to camping in a civilian campground. One of which is there is generally (no pun intended) a collection of vintage hardware on display. Travis AFB is no exception…..they have a nice museum telling the story of their role in transporting troops and material all over the world. There are a number of vintage aircraft on display outside and interesting artifacts from years past in the large museum. 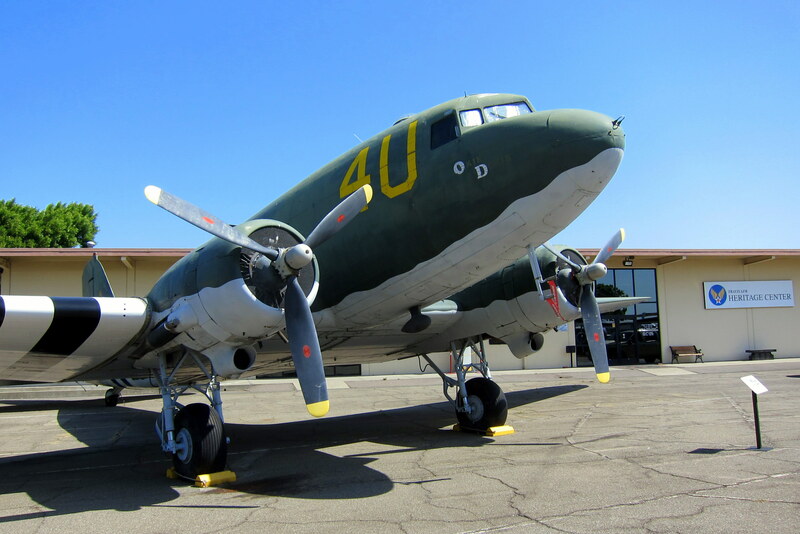 The above is a C-47 Skytrain…..which was developed from the civilian airliner, the DC-3. First built in the mid 1930’s, the DC-3 revolutionized transcontinental air travel. Previously, airline passengers wanting to fly coast to coast had to do so over a number of days by flying during the day and traveling by rail at night. 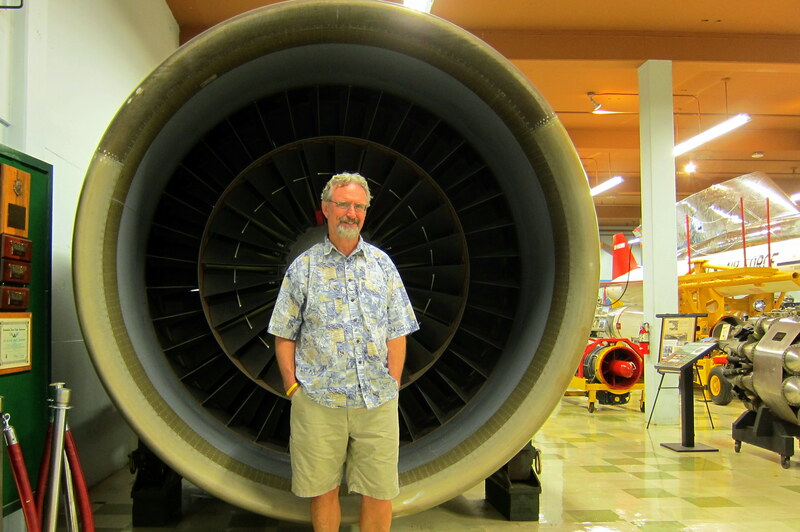 There were over 16,000 of this airframe built, and some 400 are still airworthy today! 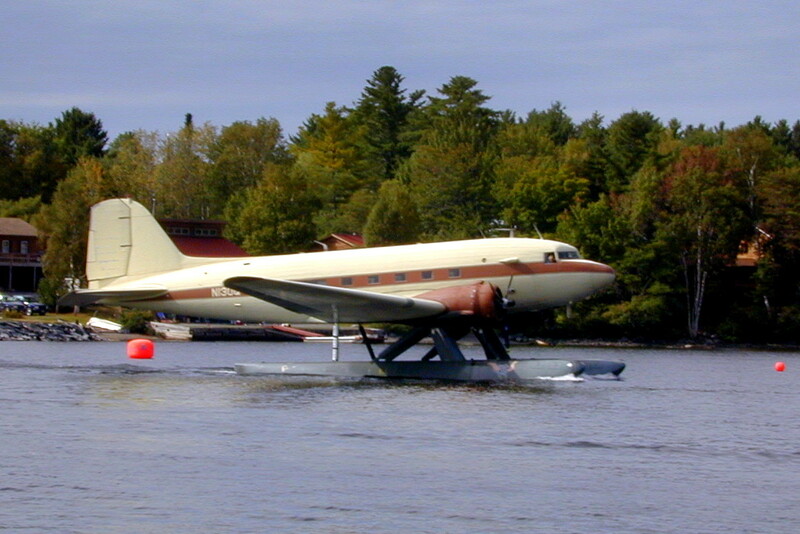 There was even a DC-3 on floats flying off of Moosehead Lake in northern Maine a number of years ago! 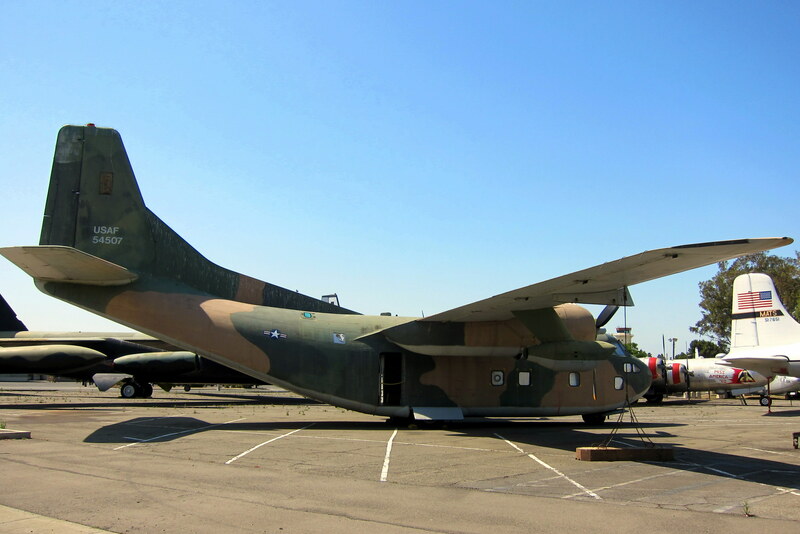 Another unusual warbird from the Second World War was the C-123 Provider. Originally built as a glider to be stuffed full of combat troops and towed over enemy lines, the powerless craft would then be released while the pilot would try and guide the thing to a suitable landing zone. Later variants were provided with engines and used for more conventional troop delivery…..like having them jump out of the craft while at altitude! The last item I found of interest was an engine for a C-5A Galaxy, which one often sees in the skies above military airfields…..the aircraft, not the engine by itself…..that would be bad! The C-5 is huge, with four huge engines hanging off its wings. How huge? This huge! A great morning at a very nice military museum…..I thoroughly enjoyed viewing the displays and talking to the volunteers that run the place and I’m sure Kit really appreciated the peace and quiet back at the camper! The other person we wanted to see while in the area was a neighbor of mine from San Diego’s Cabrillo Heights Navy Housing. This was in the late 1950’s when I was just discovering that girls did not have Cooties. Mickey and her brothers along with my brother and I would run the streets looking for, and frequently finding, adventure. We had lost touch until a few years ago when Mickey e-mailed us with some old black and white photos from that era. We were thrilled to receive the pictures and thrilled to be able to reconnect with Mickey and her meet her husband, Jim. Mickey, or Michele as she is known by today, has roots in the Boston area, so she thought it appropriate to have the group photo snapped under a Sam Adams logo! Enjoying a beautiful afternoon on the patio of Applebee’s, we spent considerable time getting reacquainted and enjoying a nice meal and a few adult beverages. 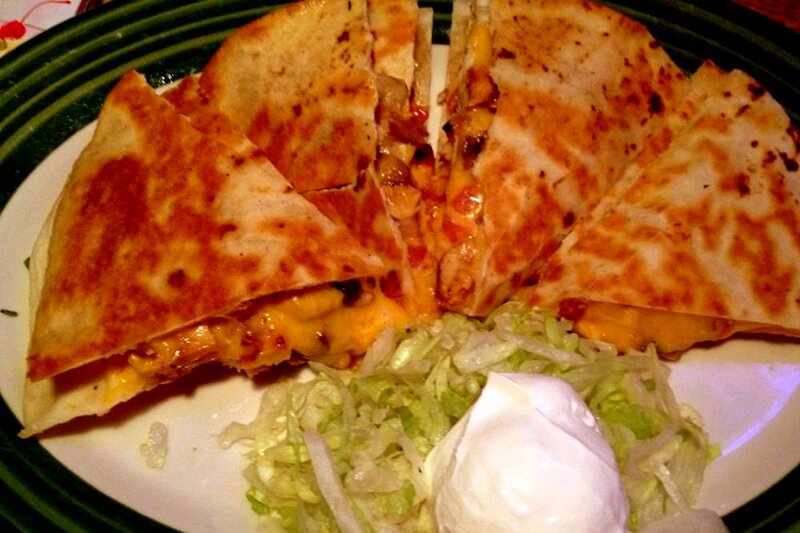 A new item on the menu that I tried was Chicken Quesadilla’s. 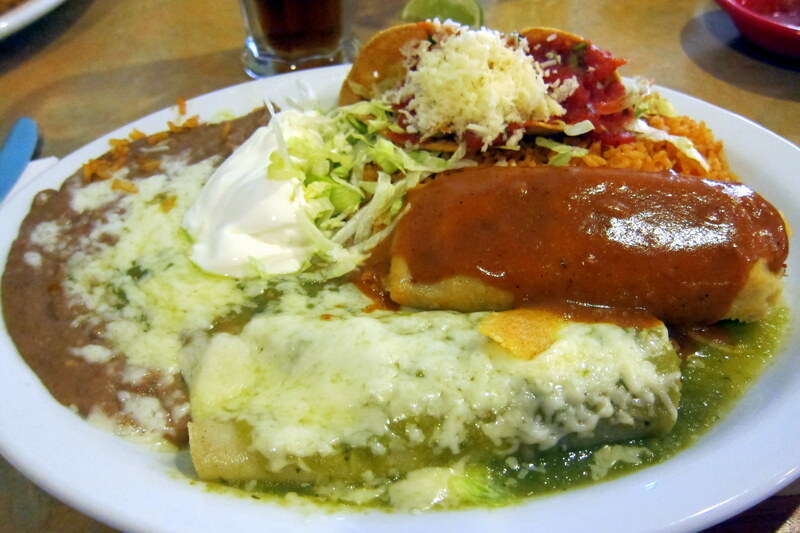 They were incredible…..every bit as good as the authentic Mexican we have been indulging in while down south. Hope they offer this menu item back home as I will definitely order it again! Mickey and Jim are government retirees and currently reside in Sacramento where they are enjoying life and driving their vintage Corvette. 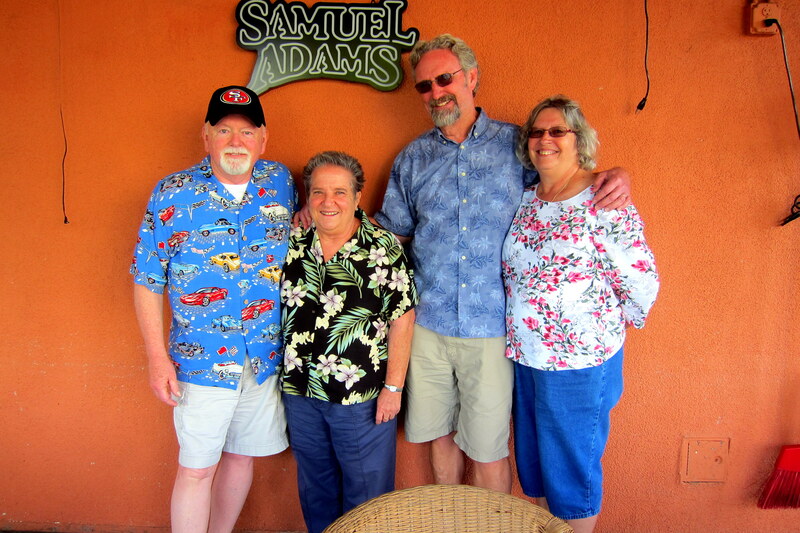 It was great visiting with them and hope they will look us up whenever they make a trip back east to see family……we would love to show them around Maine! Another event while in Fairfield was the celebration of Mother’s day. 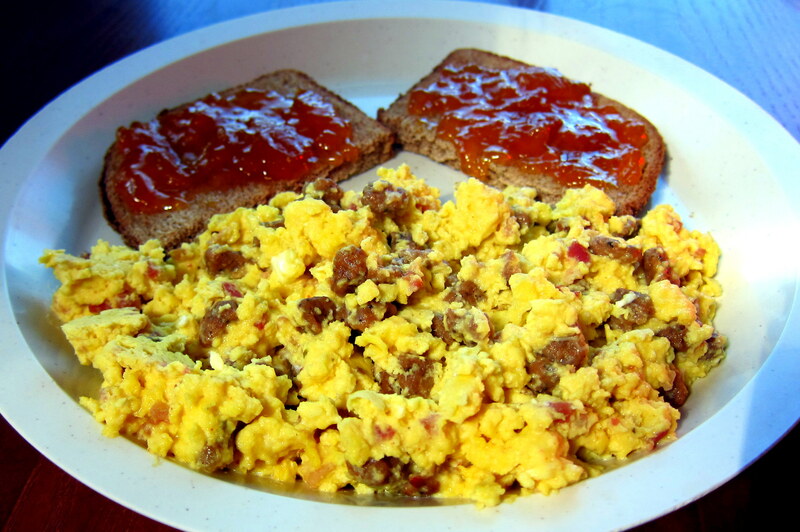 In honor of Kit’s being a great mother and fantastic grandmother, I spent considerable time concocting a dish of Bill’s Famous, Never Made the Same Way, Don’t Ask What’s in It, Scrambled Eggs! 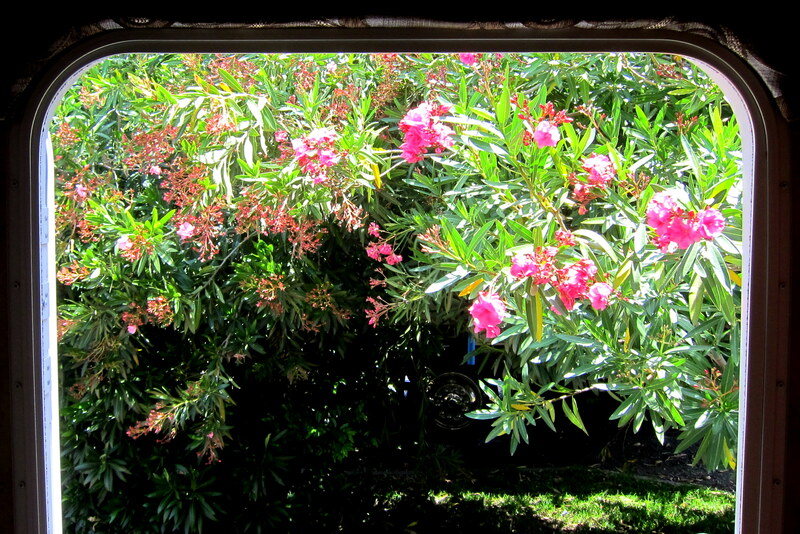 And as a thoughtful bonus, arranged for some lovely flowers to be delivered at the camper door! Well, tomorrow we pull chocks and head west. Kit and I thoroughly enjoyed our stay in Fairfield, California and visiting with some fantastic folks, but must be moving on! Tuesday, May 12, 2015: Up and on the road at 0930 under sunny, but cool weather. Once off the base, we pulled onto I-80W and, since we were going to pass very near the Napa Valley, Kit and I started to discuss the possibility of stopping at a winery or two on the way to the coast. However, Kit soon noticed a sign advertising an even more exciting stop so we pulled off the interstate and headed for a large factory and office complex in an industrial area of Fairfield. 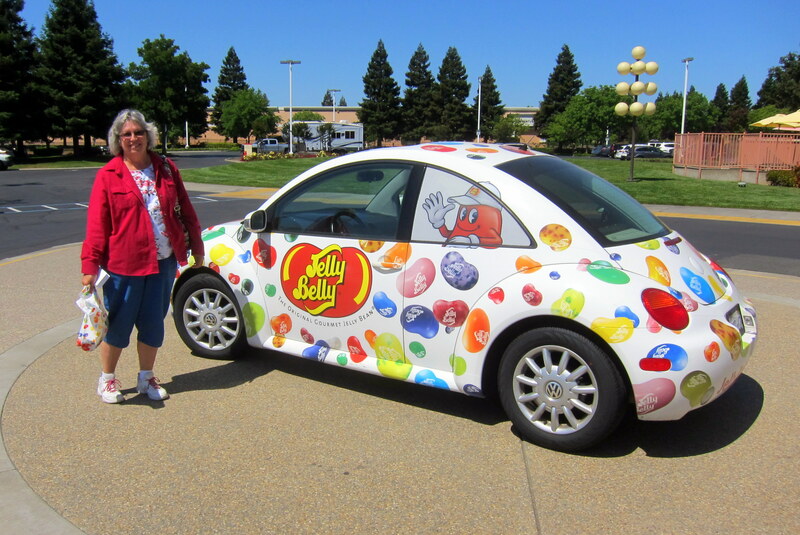 Yep…..the Jelly Belly factory! Much better than touring some dank old winery with samples of products that we wouldn’t be able to pronounce and probably couldn’t afford to buy. 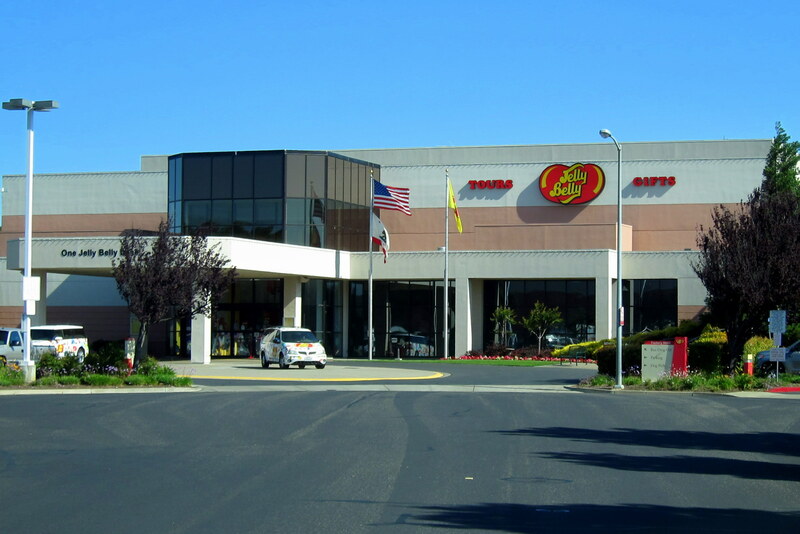 The Jelly Belly factory offers guided tours so we queued up for the next available one. While I held our places, Kit ambled about the gift shop and tastefully appointed (pun intended) tasting room. When our turn came, Kit rejoined me with a guilty look on her face and a hint of Jelly Belly on her breath. 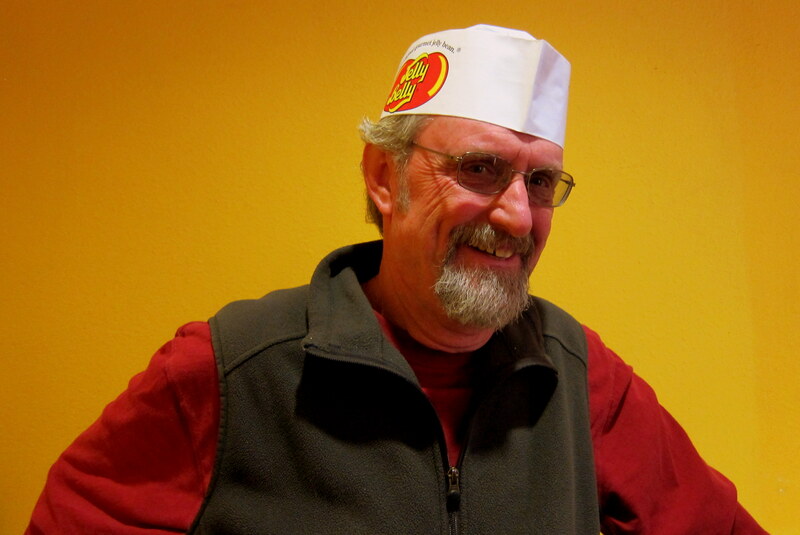 No matter, I was delighted to be given my very own spiffy hat! Oh, Kit received one as well which she wore much more fashionably than I. As a matter of fact, the whole tour group received special hats! However, some of the touree’s (yea, I know, I made up that word…..but I like it!) 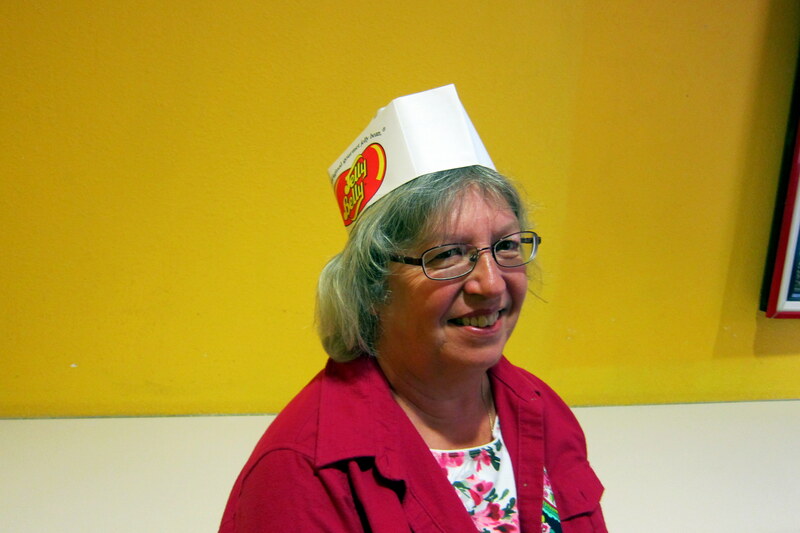 had an issue with their religious headgear and the official Jelly Belly chapeau papier. Not sure why a group of Muslims were in the tour group that day but I suspect it had something to do with world peace and understanding through the magic of Jelly Beans! The tour was top secret and no photography of any kind was allowed, so regrettably, there are no pictures. 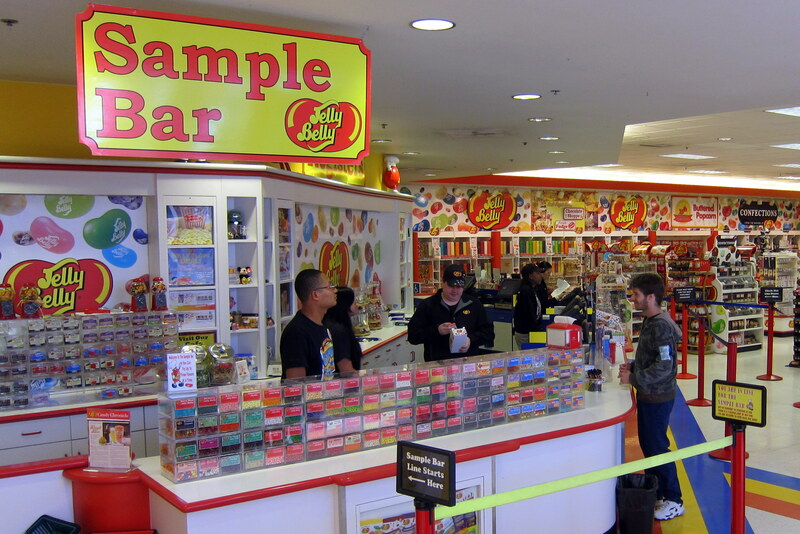 However an accurate verbal description of what was behind the triple locked and armed guarded doors follows: A bunch of machinery making a bunch of Jelly Bellies and the whole place smelled of Jelly Beans! OK, so now that you know the secret…..please burn the paper from which you just read this on. After departing the factory, and signing our nondisclosure statements, Kit went to the gift shop and I toured the adjacent art gallery. 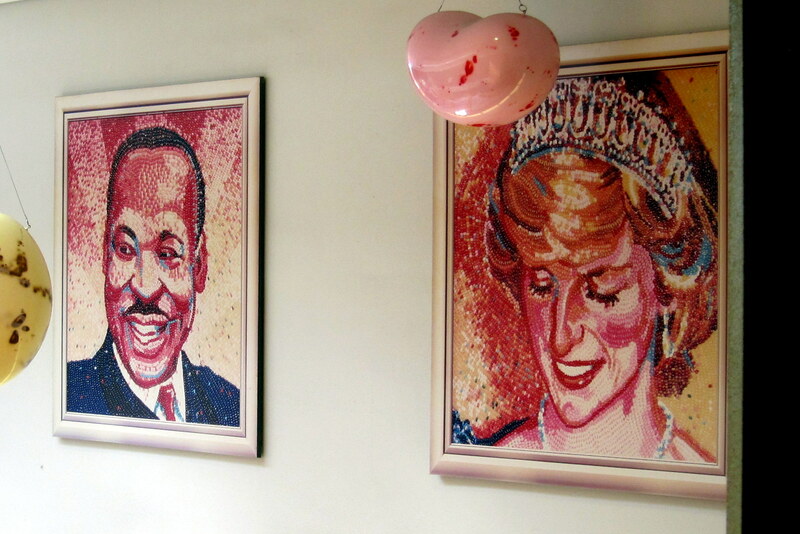 If you are at all known in this world today, you have been immortalized in Jelly Bellies! Including the man who did more for Jelly Bellies than he ever did for Hollywood! 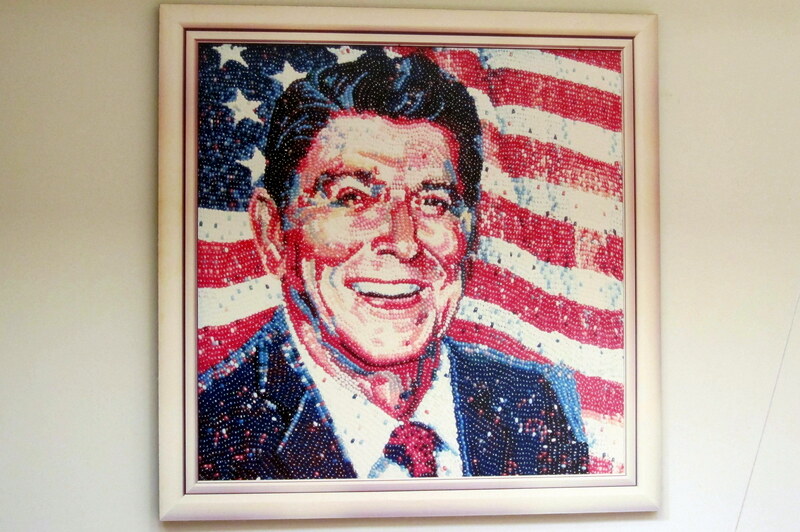 And don’t call him Candy Face…..Republicans still revere this man, and have lots of guns! I was walking out of the gallery as Kit was coming out of the gift shop laden with brightly decorated shopping bags. So, what did my bride purchase? 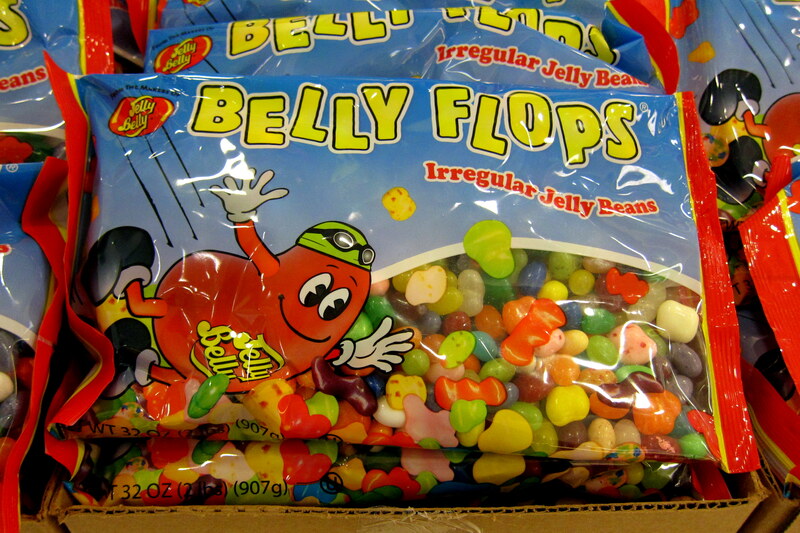 Yep, Belly Flops, or to be more politically correct, Irregular Jelly Beans…..ten pounds worth! And why? Well, she felt sorry for the marginalized tiny candies with the irregular shapes and colors, and because they tasted every bit as good as the top shelf ones but were about half the price…..smart woman! 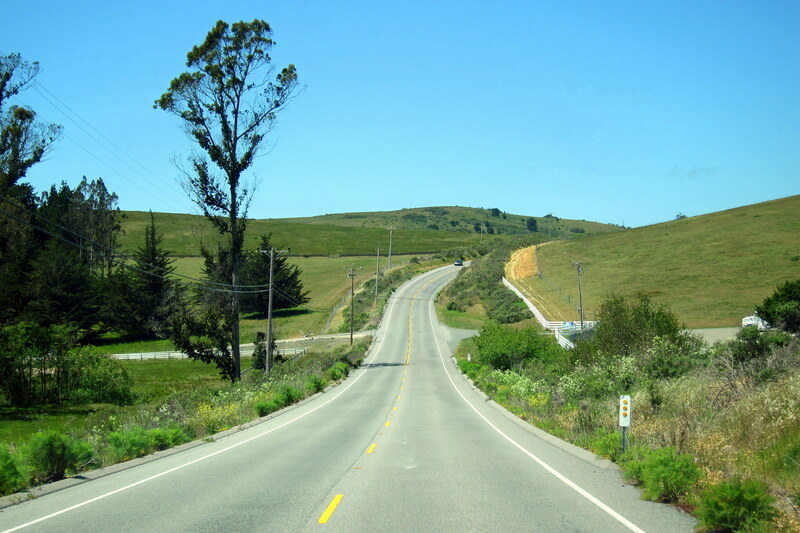 Rolling out of the Jelly Belly parking lot, we made our way on CA-12 and headed west which took us just south of Napa. 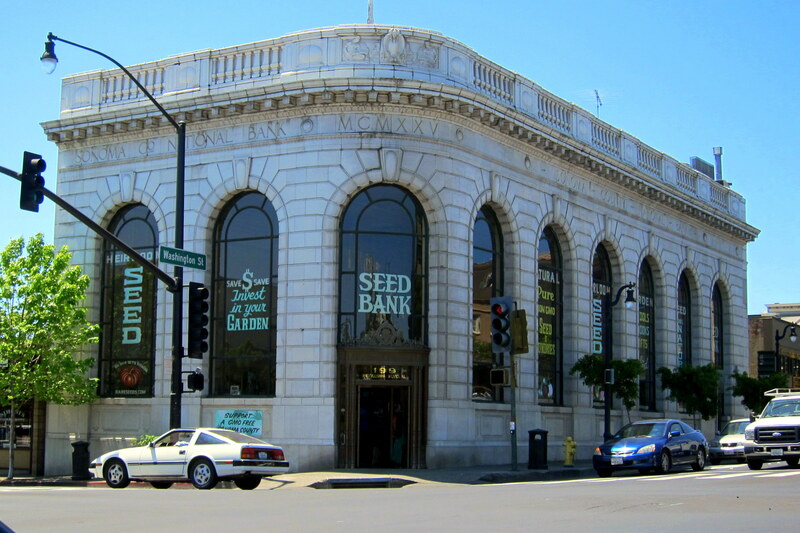 Where the state of California protects its most valuable assets…..seeds in an actual bank! Yep, a bank building from the 1920’s now houses heirloom seeds in its vault! 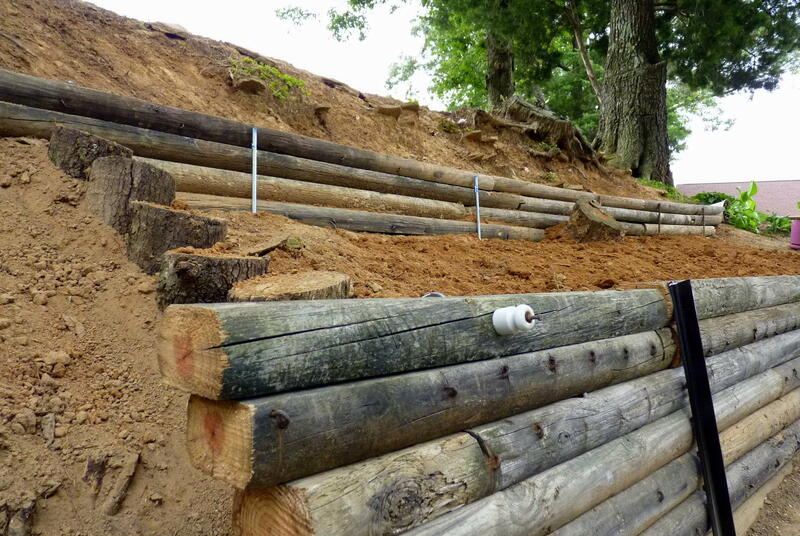 And next door is the Dirt Bank! Unfortunately, this was all for naught as the nearby Water Bank had been overdrawn and was empty. 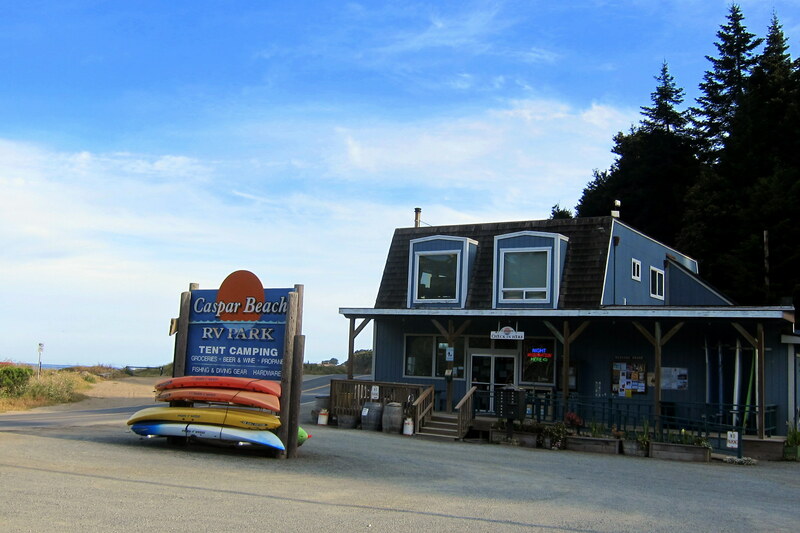 Next, Kit and I traveled through or around a variety of other small California hamlets until we reached our destination…..CA-1, also known as the Pacific Coast Highway (PCH) which is a highway that pretty much parallels the Pacific Coast. 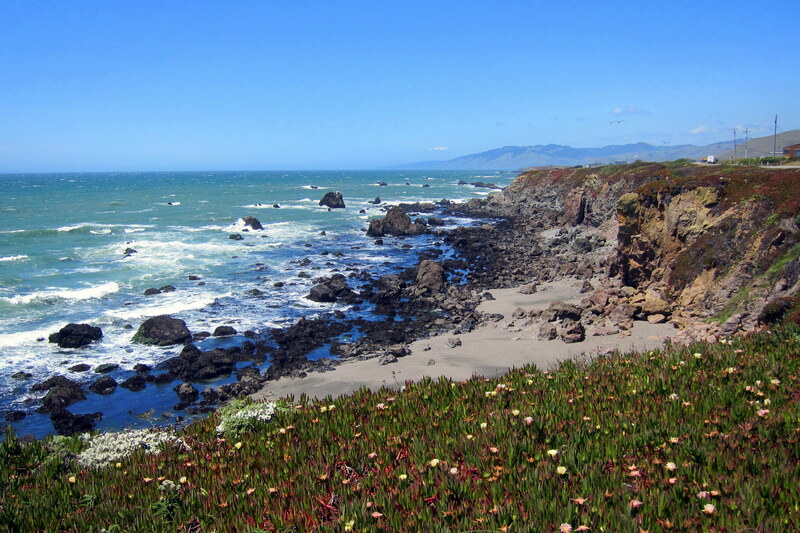 Just past Bodega Bay, we stopped at a roadside turnout to walk about, stretch our legs, and have lunch while we enjoy our first glimpse of this incredible shoreline. Back on the twisty two lane road that is the PCH, we meandered along with the ocean to our left and hillsides to our right. Fortunately, most folks behind us were courteous as we lumbered along and I returned the favor by pulling over at every opportunity to allow the long train of vehicles following us to pass by. However, some times the backup along the PCH wasn’t our fault. 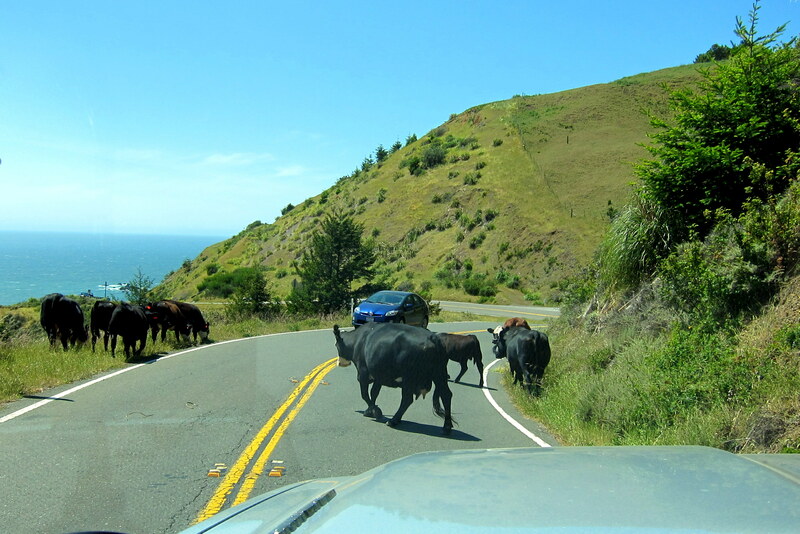 This is open rangeland and livestock can frequently be spotted waddling along the road. 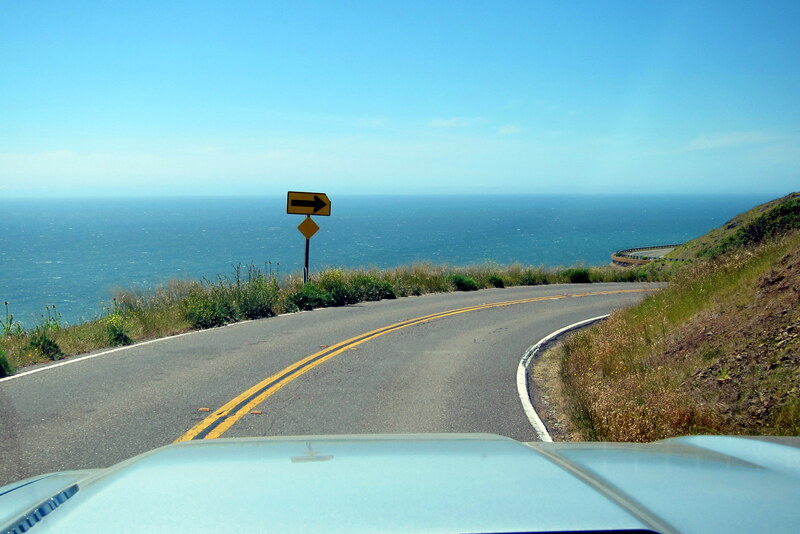 Contrary to its title, the PCH doesn’t always follow the Pacific Coast…..sometimes it diverts inland to get around a particularly steep section. 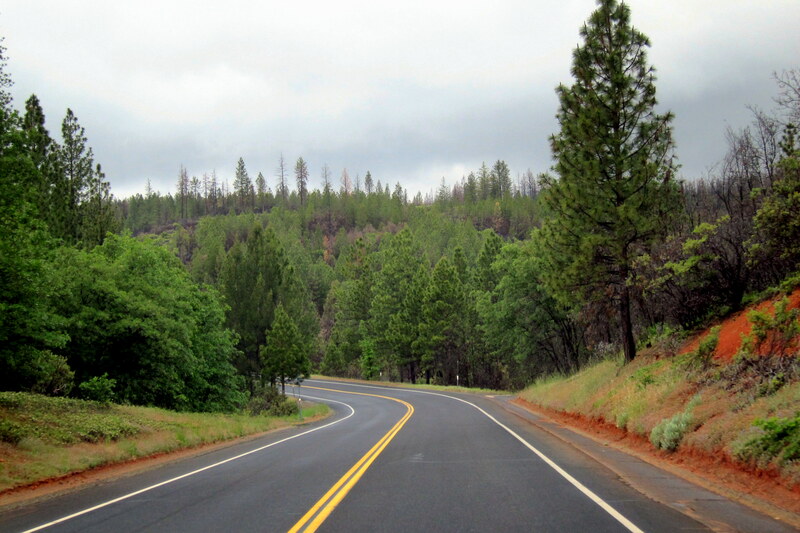 On those occasions, the view is just as nice as lush vegetation and coastal pines align the road. 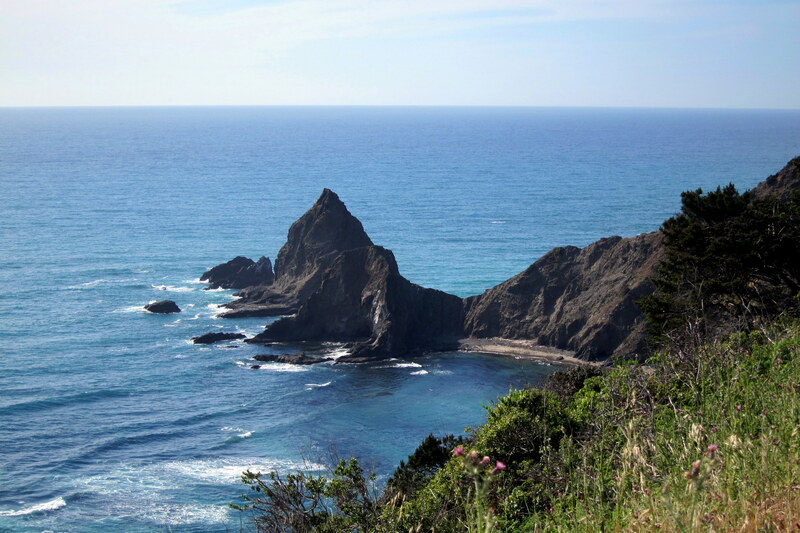 But the real treat to traveling the coast highway is the views of sky, ocean and rock formations. Getting late, Kit used the App All-Stays to find us a very nice oceanfront campground at Casper Beach. 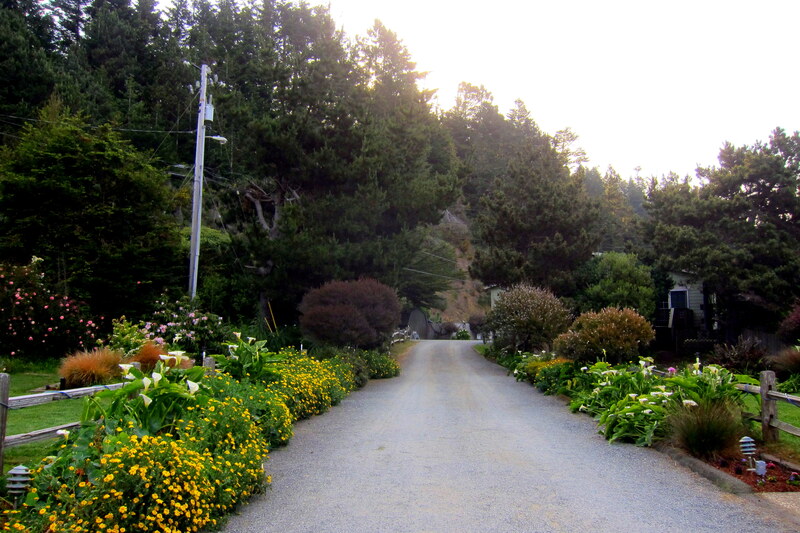 After registering, we drove up a narrow valley with beautiful flowers planted on either side of the path. As the valley opened up into a small meadow we found our campsite for the evening. 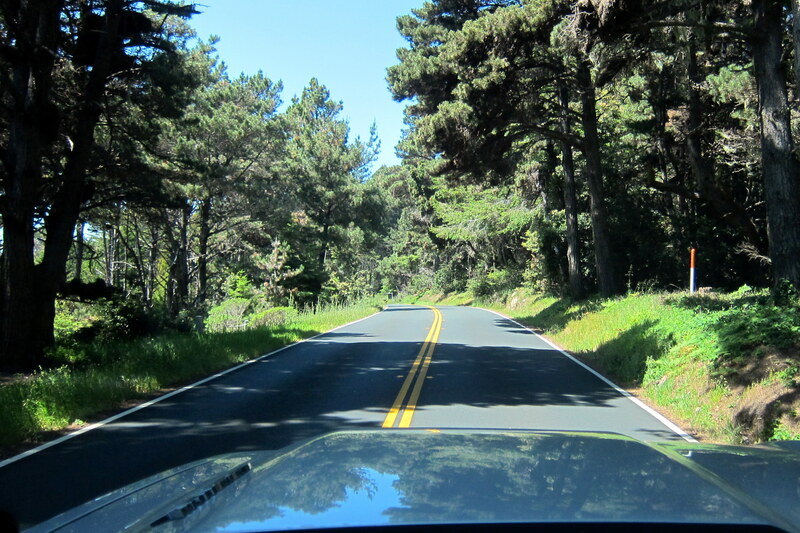 Tomorrow we continue north up the Pacific Coast Highway….stay tuned! Kit’s Bit’s: It was great reconnecting with my friend, Nancy, from Jr. High. Once I left high school, half way through my Jr. Year, I lost contact with all the kids I knew. I’m just now learning of all their fun and shenanigans as they finished high school and either went on to college or jobs. It may be a good thing I didn’t know all this stuff, I may have felt deprived with already being settled into marriage and having a family. Who knows! It’s always fun to hear about old friends escapades! It was also fun reconnecting with Mickey. She and her family were good friends with Bill and his family. They had lots of memories to share from before I knew him! This entry was posted in 2015 Excellent Adventure. Bookmark the permalink. Thanks and you’re welcome! We are in Northern Minnesota and very slowly meandering our way east……hope to be there sometime this year! Thanks for the very nice compliment. Who knew that I, of all people, could take some snapshots and add some words and folks would actually enjoy the offering!?!? Take care! Don’t know how to fix my error on our name….says your comment is awaiting moderation, but you know I am pretty well helpless with a computer! Anyhow, am sure you know who we are! Yep, figured it out and approved it immediately! Sounds like a deal! Kit and I are in Northern Minnesota where, by the way, it is raining pretty hard. Pulled into a really nice COE campground on the Mississippi River…..only $13.00 a night with the Senior Pass!! Slowly, very slowly, meandering easterly…..should get to Maine before it snows!?!? We thoroughly enjoyed a three-hour early dinner with Bill ‘n Kit which was totally unexpected, a last minute surprise, given that Bill ‘n Kit didn’t know how CLOSE to Dublin, CA (where Chuck and I live) they were while visiting in Fairfield. What a delightful surprise to get to know the wonderful Bill, while Kit ‘n me “just picked up wherever we left off” as good old girlfriends do. I can’t even believe it’s been 50 years since we were together, Kit!! We have TWO regional parks within 20-25 minutes of Dublin, so please put us on next year’s “route”! I’m sure you are at this point “hankering for home and the lake.” Safe travels! Great to meet you folks, and thanks for the tip on camping opportunities near you. You may very well see us up that way in another few years or so. Take care, enjoy the summer!! GOOD MORNING, I’M SURE YOU’RE NOT UP YET, AS IT’S ABOUT 6AM HERE. BEAUTIFUL CLEAR COOL MORNING, AND WILL SOAR INTO THE 70S LATER IN THE DAY. THAT SCENERY ALONG THE PACIFIC COAST IS SPECTACULAR. JEANNE ALWAYS WANTED TO MAKE THAT TRIP. WHO KNOWS, WE MIGHT JUST DO THAT FOR OUR 60TH WEDDING ANNIVERSARY. HAVE A SAFE TRIP BACK EAST. 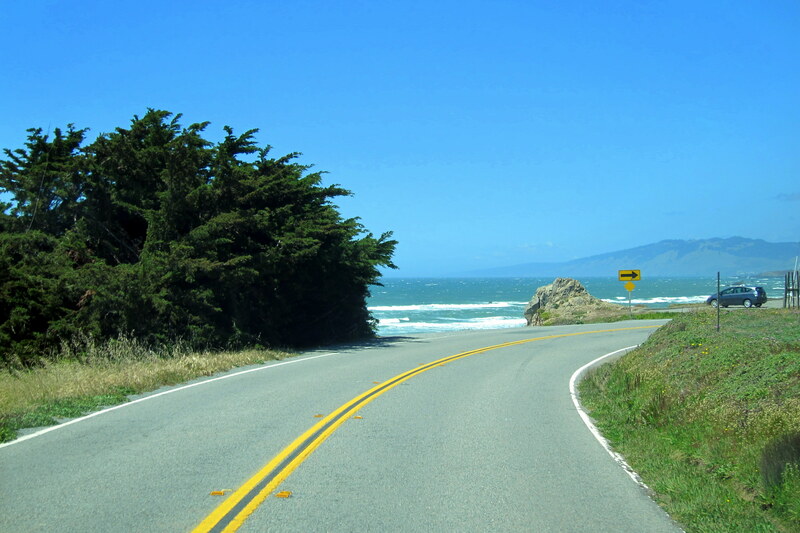 We highly recommend a slow road trip along the Northern California coast! Making it happen over your 60th anniversary would be great….do it!! What a nice comment…..thanks! Kit is a great mom to the kids and I. Yep, you read that right!! Bill and Kit, this is the second time during your 2015 grand adventure that I was in the same place as you, but on a slightly different day. It seems I missed you by a few days when you were in northern CA. 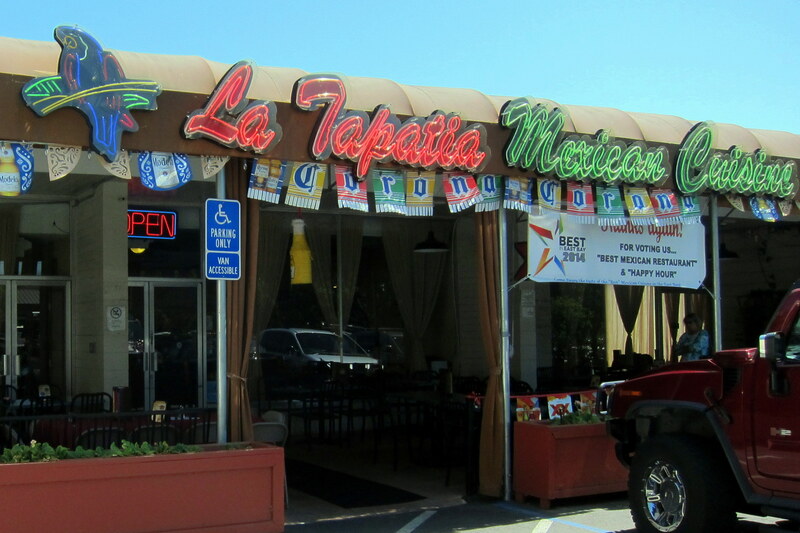 When I am in the Concord area, I like to eat at Las Montanas, the Mexican restaurant that is in the shopping center right across the street from LaTapatia. Las Montanas has great margaritas and has a live mariachi band on Wednesday evenings. Enjoy the rest of your adventure. Thanks, Don. We seem to always cross paths a few days apart. Someday the stars will line up and we can connect!